It's ONLY 6 months until Christmas....it always freaks me out when people start posting such statements on social media. I have plenty of time to get things done but it still freaks me out. So if your like me and have been trying to get an earlier jump start on gift making, there is a another great group of amazing bloggers joining me this week in sharing with you some holiday inspiration from my Holiday Wishes book. I have always been a big fan of gingham so I thought a quilt with pieced gingham and some stars thrown in would be fun and it turned out to be one of my favorites! 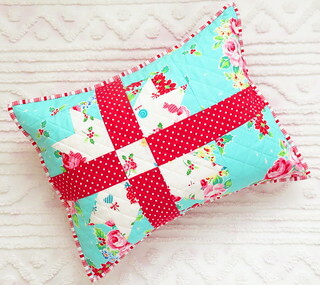 If you would like a kit of the Gingham Stars quilt in the fabrics shown you can find it HERE. I love two color quilts that have a Scandinavian look and in the Holiday Wishes book there is the Norwegian Holiday quilt. It's a perfect bed quilt for winter! I love red and white but try it in your favorite colors. I think it would be wonderful in just about any color combination. And Christmas wouldn't be complete without some snowmen! So I have a lap quilt and you can add blocks to it to make it bed size if you like. And a tree skirt that you can also use as a table cloth if you don't cut the hole in it! So that is the last of the quilts from the Holiday Wishes book that we have shown you over the past month. I hope it has inspired you to sew up some holiday cheer! If you would like to start with a small project, I have something special to share with you today. As a thank you for hopping with us, there is an exclusive pattern for you that uses the snowman block from the tree shirt pattern in the book. It makes four place mats for your holiday gatherings! They would also make great gifts! You can find the FREE pattern on the Jolly Jabber. So download the pattern, grab your book, your favorite holiday fabric and have some fun! Be sure to stop by all the amazing bloggers who are joining me this week and see the beautiful projects they have sewn from the Holiday Wishes book. And I want to say a BIG thank you to all the bloggers who have joined me this month. I appreciate you all and all the wonderful things you have sewn up to share with us! and Instagram and you are welcome to join my Facebook group called Sweet Stitchin's with This & That. It is hump day and time for some more Holiday inspiration with some great bloggers who are joining me in sharing with you projects from my Holiday Wishes book! Midnight Stars is more of a winter quilt than just Christmas and I think you can use just about any style fabric and it will look wonderful. I would love to make it in orange and black for fall. Now if I could just buy time to get it done! Deck the Halls is a mini quilt that can be used in many ways from a wall hanging to a table topper. Or make 4 of the stars and use it as a trivet! And then there is Merry Gifts. This is such a cheerful quilt and I am looking forward to wrapping up with it this winter as the snow falls while drinking hot chocolate by the fire! A fun suggestion for this pattern is to take one block and make a pillow like Pam Kitty Morning did or you could use some birthday fabric and make one block into a placemat for that special persons big day! More coming next week along with a special surprise for you! Be sure to hop over to the amazing bloggers who are joining me and sharing what they whipped up from the Holiday Wishes book! Another week of Christmas inspiration to help you get a jump start on your Holiday sewing! We have a great line up of bloggers this week to share with you the projects they have made from my Holiday Wishes book. But first I want to share a few of my own pictures I took while I was creating the quilts for the book. The cover quilt is a block of the month called Midnight Clear with 6 different blocks and sashing that I think looks like holly and berries. There is a table topper called Blizzard that I think is just fun. Santa's Socks is a lap quilt that reminds me of Argyle socks. And Comfort and Joy is a sweet little mini wall hanging. More inspiration coming next week! Be sure to hop on over to the great bloggers who are joining me and see what they created using the Holiday Wishes book! I am so excited to share with you a Christmas in July blog hop featuring my new Holiday Wishes book! There is a whole group of amazing bloggers who are joining me to inspire you to get a jump start on your holiday sewing. Every year I love to give handmade gifts but every year I run out of time. So this year we will give you lots of ideas to start your quilting early and when Christmas arrives you will be ready to just wrap your gifts up and enjoy a cup of hot chocolate. Holiday Wishes features 12 quilt patterns that are perfect for decorating your home for the holidays. But just because they are sewn with Christmas fabric doesn't mean you have to make them that way. I love to take quilt pattern and make it from different fabrics to give it a different feel. So just because something is in a Christmas book and shown in Christmas fabric doesn't mean you can't make it any way you want! Be sure to hop on over to see what the Holiday Wishes bloggers have cooked up for you! I am super excited to announce my second holiday book published by Fat Quarter Shop! There is 12 projects in the book in a variety of sizes, so depending how much time you have, we have a project for you. The quilts are all made with the new Christmas fabrics from Moda......and I am loving them! You can find the fabric kit HERE. It will ship when the fabric arrives in the spring. I am a lover of plaid and Gingham Stars has plaid! I think this quilt in the holiday colors is wonderful but it would also look great in some spring florals so I think a sew along might be happening. Will you join me? When I finished the top I tried to get a good picture but the wind was kicking up and make it kind of crazy to get a good shot. But I think this one turned out pretty, even with the crazy wind and our fingers freezing. For a fun re-cap of all the quilts along with the finished sizes, check out the sweet video The Fat Quarter Shop has put together for me. I will be hosting some sew-alongs and extra projects that will use the blocks from the book so I hope you will join me in some fun sewing this year as we get ready for the holidays! P.S. You can find me HERE on Facebook and HERE on Instagram. If you would like to join my Facebook Sweet Stitchins' group, you can find that HERE.